As some of you might be aware, this is my last year at the Perimeter Institute. It’s been great, but the contract was only for three years, and come August I’ll be heading elsewhere. Determining that “elsewhere” was the subject of an extensive job search. Now that the search has resolved, I can tell you that “elsewhere” is the Niels Bohr International Academy at the Niels Bohr Institute in Copenhagen, where I’ll be starting a three-year postdoc job in the fall. There are some pretty stellar amplitudes people at NBIA, so I’m pretty excited to be going there. It’s going to be a great opportunity to both build on what I’ve been doing and expand beyond. They’re also hiring several other amplitudes-focused postdocs this year, so overall it should be a really fun group. It’s also a bit daunting. Moving to Canada from the US was reasonably smooth, I could drive most of my things over in a U-Haul truck. Moving to Denmark is going to be quite a bit more complicated. I’ll need to learn a new language and get used to a fairly different culture. I can take solace in the fact that in some sense I’m retracing my great-grandfather’s journey in the opposite direction. My great-grandfather worked at the Niels Bohr Institute on his way out of Europe in the 1930’s, and made friends with the Bohrs along the way, before coming to the US. I’ll get a chance to explore a piece of family history, and likely collaborate with a Bohr as well. This entry was posted in Life as a Physicist and tagged academia, DoingScience, postdoc on January 13, 2017 by 4gravitonsandagradstudent. I’m moving in at Perimeter this week, so I don’t have time to write a long post. For those who aren’t familiar with it, the Perimeter Institute for Theoretical Physics is an independent research institute, not affiliated with any university. Instead, it’s funded by a combination of government and private sources (for why private sources might fund theoretical physics, read my discussion here). Because it’s not a university they have budgets to do things like hire people to make the transition process easier, so everything has been really nice and well-organized. The postdoc offices are really nice, with a view of the nearby park, shown below. This entry was posted in Life as a Physicist and tagged academia, postdoc, theoretical physics on August 15, 2014 by 4gravitonsandagradstudent. Ever felt like you don’t belong? Like you don’t deserve to be where you are, that you’re just faking competence you don’t really have? If not, it may surprise you to learn that this is a very common feeling among successful young academics. It’s called impostor syndrome, and it happens to some very talented people. It’s surprisingly easy to rationalize success as luck, to assume praise comes from people who don’t know the full story. In science, we’re surrounded by people who seem to come up with brilliant insights on a regular basis. We see others’ successes far more often than we see their failures, and often we forget that science is at its heart a process of throwing ideas against a wall until something sticks. Hyper-aware of our own failures, when we present ourselves as successful we can feel like we’re putting on a paper-thin disguise, constantly at risk that someone will see through it. 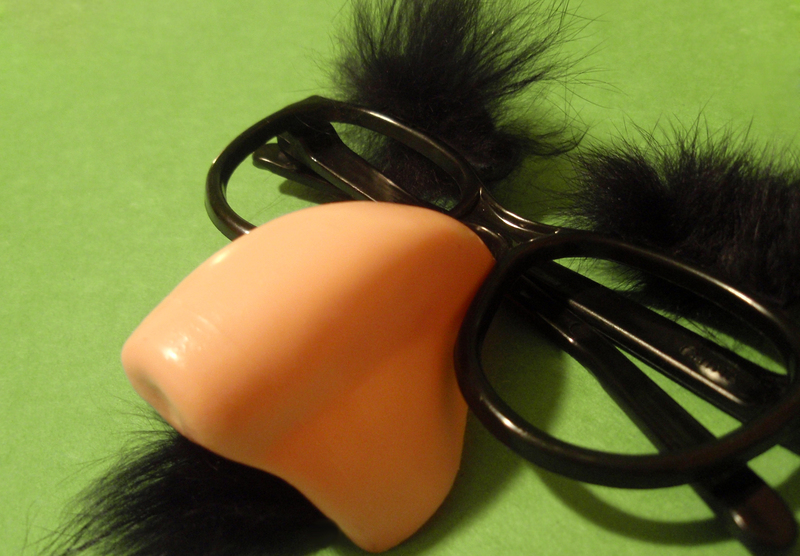 As paper-thin disguises go, I prefer the classics. In my experience, theoretical physics is especially heavy on impostor syndrome, for a number of reasons. First, there’s the fact that beginning grad students really don’t know all they need to. Theoretical physics requires a lot of specialized knowledge, and most grad students just have the bare bones basics of a physics undergrad degree. On the strength of those basics, you’re somehow supposed to convince a potential advisor, an established, successful scientist, that you’re worth paying attention to. Throw in the fact that many people have a little more than the basics, whether from undergrad research projects or grad-level courses taken early, and you have a group where everyone is trying to seem more advanced than they are. There’s a very real element of fake it till you make it, of going to talks and picking up just enough of the lingo to bluff your way through a conversation. And the thing is, even after you make it, you’ll probably still feel like you’re faking it. As I’ve mentioned before, there’s an enormous amount of jury-rigging that goes into physics research. There are a huge number of side-disciplines that show up at one point or another, from numerical methods to programming to graphic design. We can’t hire a professional to handle these things, we have to learn them ourselves. As such, we become minor dabblers in a whole mess of different fields. Work on something enough and others will start looking to you for help. It won’t feel like you’re an expert, though, because you know in the back of your mind that the real experts know so much more. In the end, the best approach I’ve found is simply to keep saying yes. Keep using what you know, going to talks and trying new things. The more you “pretend” to know what you’re doing, the more experience you’ll get, until you really do know what you’re doing. There’s always going to be more to learn, but chances are if you’re feeling impostor syndrome you’ve already learned a lot. Take others’ opinions of you at face value, and see just how far you can go. This entry was posted in Life as a Physicist and tagged academia, DoingScience, grad school, postdoc, theoretical physics on August 1, 2014 by 4gravitonsandagradstudent. I’m visiting Perimeter this week, searching for apartments in the area. This got me thinking about how often one has to move in academia. You move for college, you move for grad school, you move for each postdoc job, and again when you start as a professor. Even then, you may not get to stay where you are if you don’t manage to get tenure, and it may be healthier to resign yourself to moving every seven years rather than assuming you’re going to settle down. Suppose you’re married, or in a committed relationship. Better hope your spouse has a flexible job, because in a few years you’re going to be moving to another city. This is even harder if your spouse is also an academic, as that requires two rare academic jobs to pop up in the same place. And woe betide you if you’re out of synch, and have to move at different times. Many couples end up having to resort to some sort of long-distance arrangement, which further complicates matters. Like the two-body problem, but for polyamorous academics. Leads to poly-chains up and down the East Coast. Alternatively, add a time dimension to your two-body problem via the addition of children. Now your kids are busily being shuffled between incommensurate school systems. But you’re an academic, you can teach them anything they’re missing, right? Of course, all this assumes you’re in a relationship. If you’re single, you instead have the problem of never really having a social circle beyond your department, having to tenuously rebuild your social life every few years. What sorts of clubs will the more socially awkward of you enter, just to have some form of human companionship? We live in an age where everything is connected, but that doesn’t make distance cheap. An ocean between you and your collaborators means you’ll rarely be awake at the same time. And good luck crossing that ocean again, not every job will be eager to pay relocation expenses. Of course, the various nations involved won’t make all this travel easy. Many countries have prestigious fellowships only granted on the condition that the winner returns to their home country for a set length of time. Since there’s no guarantee that anyone in your home country does anything similar to what you do, this sort of requirement can have people doing whatever research they can find, however tangentially related, or trying to avoid the incipient bureaucratic nightmare any way they can. This entry was posted in Life as a Physicist and tagged academia, DoingScience, grad school, physics, postdoc on June 6, 2014 by 4gravitonsandagradstudent. As a few of you already know, it’s looking increasingly certain that I will be receiving my Ph.D. in the spring. I’ll graduate, ceasing to be a grad student and becoming that most mysterious of academic entities, a postdoc. When describing graduate school before, I compared it to an apprenticeship. (I expanded on that analogy more here.) Let’s keep pursuing that analogy. If a graduate student is like an apprentice, then a Postdoctoral Scholar, or Postdoc, is like a journeyman. In Medieval Europe, once an apprenticeship was completed the apprentice was permitted to work independently, earning a wage for their own labors. However, they still would not have their own shop. Instead, they would work for a master craftsman. Such a person was called a journeyman, after the French work journée, meaning a day’s work. Similarly, once a graduate student gets their Ph.D., they are able to do scientific research independently. However, most graduate students are not ready to be professors when fresh out of their Ph.D. Instead, they become postdocs, working in an established professor’s group. Like a journeyman, a postdoc is nominally independent, but in practice works under loose supervision from the more mature members of their field. Another similarity between postdocs and journeymen is their tendency to travel. Historically, a journeyman would spend several years traveling, studying in the workshops of several masters. Similarly, a postdoc will often (especially in today’s interconnected world) travel far from where they began in order to broaden their capabilities. A postdoctoral job generally lasts two or three years, one for particularly short positions. Most scientists will go through at least one postdoctoral position after achieving their Ph.D. In some fields (theoretical physics in particular), a scientist will have two or three such positions in different places before finding a job as a professor. Postdocs are paid significantly better than grad students, but generally significantly worse than professors. They don’t (typically) teach, but depending on the institution and field they may do some TA work. Keep the old title. Keeping the same title and domain name makes it easier for people to find the blog. It also maintains the alliteration, which I think is fun. On the other hand, it would be hard to justify, and I’d likely have to write something silly about taking a grad student perspective or the like. Change to “4 gravitons and a postdoc”. I’d lose the fun alliteration, but the title would accurately represent my current state. However, I might lose a few readers who don’t expect the change. Cut it down to “4 gravitons”. This matches the blog’s twitter handle (@4gravitons). It’s quick, it’s recognizable, and it keeps the memorable part of the old title without adding anything new to remember. However, it would be less unique in google searches. What do you folks think? I’ve still got a while to decide, and I’d love to hear your opinions! This entry was posted in Life as a Physicist and tagged academia, DoingScience, postdoc on December 27, 2013 by 4gravitonsandagradstudent.